← The list of companies I will not do business with is growing, peeps. It’s growing. This is my latest version, so I’m reposting. Avocados. 3 large, 6 small, doesn’t really matter. However much you want. Vary it! And keep two of the pits. Not for making necklaces, to keep the guac from browning, sillies. 1 lime for juicing. I usually use the whole lime. Sometimes the lime doesn’t want to give you its juice. You make it! Roll that sucker back and forth on the counter to loosen it up before you cut it in half. 1 orange for juicing. I generally use only half the orange and then eat the other half while I’m cooking, but if I have a LOT of avocados, I’ll use the whole thing. But if you use the whole thing, use two limes. Cilantro to taste. I put a big honkin’ handful in there. If I have a lot of avocados, I’ll use more than that. Jalapenos or serranos to taste. I like it somewhat spicy, so I like 2-3 jalapenos without seeds but with rinds for small amount of avocados, 2-3 jalapenos with seeds and rinds for more avocados. Now, in Florida, we just don’t get hot jalapenos, so I use more. If you like it mild, add a jalapeno with no seeds and no rinds. Or move to Florida. When I actually get a hot one (you can tell, because if you put your face right up next to it, your eyes water), I usually wear gloves when I’m chopping it, because my fingers start to burn otherwise, and I still feel it the next day. Now. I made the delicious green stuff with serranos the other day, and I had 3 regular avocados, used 3 serranos with all seeds and rinds, and the heat was perfect. But the serranos didn’t seem spicy in the face test. Garlic powder to taste. I used to use fresh garlic, because I’m almost exclusively fresh with my garlic (if you know what I mean), but you can’t really tell what fresh garlic is going to do to your guac until the next day, so it’s fine the day of, but leftovers are overpowered by the ajo. And I’m not going to tinker until I get it right just so I can figure out how much garlic to use per avocado. Garlic powder is easier. Lawry’s seasoned salt to taste. Best thing is to alternate adding the garlic powder and the seasoned salt. I’m hoping that after I go off gluten and corn, the cornstarch won’t bother me. I reeeeally hope I can still have cornstarch after I cut out corn. Also, Lawry’s contains no MSG. But if for some reason you can’t have Lawry’s, you can use the salt of your choosing. But don’t blame me when your guac isn’t perfect (also, since I’m not personally putting yours together, I can’t take the fall for your inability to produce the perfecto blendo). UPDATE: Note, I generally use Kosher salt these days, and it’s just as good. 1) Y’all better not have started without me. This is important. You save the avocados for last. Do not put them in the bowl until everything else is prepared and ready. Don’t even open them up yet. Let them sit on the counter and look pretty. 3) Roll the lime on the counter for max juiceage, cut it, squeeze it nice and juicy into the bowl. 4) Roll the orange on the counter for max juiceage and so it doesn’t feel left out, squeeze half of it into the bowl (unless you have LOTS of avocados–too much orange doesn’t completely ruin your guac, but it also makes you wish you’d listened to SarahK). 5) Wash and chop up a giant handful (or more, if you please, less if you’re crazy) of that wonderful blessed herb, cilantro. Throw it on top of the juices. 6) Dice up your red onion, just a little bit, don’t go wild with it. And chop it up really small. 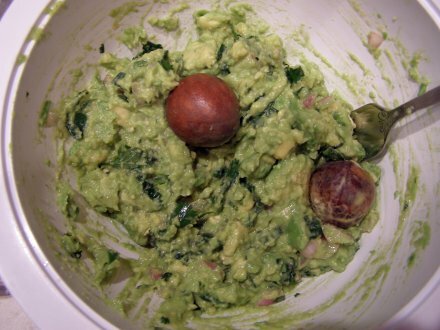 The only major chunks you should have in your guac are avocados. Onion should be diced small, and peppers should be chunky but still relatively small. 7) Chop the peppers (if you’re not using the seeds and/or rinds, take all that stuff out first, it’s way easier that way, but you probably already know that); throw those in. 8) Add the garlic powder and the salt. By this point, you should have a spoon out so you can taste the spices and herbs. Make sure you like all that flavor, but remember, you’re going to dumb it down just a little when you add your creamy avocado sabor, so maybe make it a little edgier than you want your finished product. You can add extra of everything later, but you don’t want to do too much of that, because like I said, you do not want creamy guac from too much stirring–it’s against the law. I will citizen’s arrest you and forbid you ever make guac again if you make it creamy. 9) Alright, the avocados. Open those up, half-wise. Save two pits, three if you have a large batch. Throw the rest out. (To remove pits–in case you don’t know how, I used to use a spoon to wedge them out–hold the avocado half in the palm of your hand, and smack the center of the pit with a sharp knife, around the middle to middle-back of the blade. The knife should stick in the pit. Twist the pit side to side until it’s ready to come out, then pluck carefully with the knife. It’s important that you have ripe and not just almost-ripe fruit. Oh, and don’t try this at home, kids.) Score the flesh to look like checkerboards (three or four cuts each direction), so they’re already diced before you take them out of their peels. Then I just use both of my thumbs and flick the flesh into the bowl. Sometimes I use a potato masher to mash the avocados (not much mashing), then stir it all up with a fork. Other times I do all the mashing with a couple of forks, mixing while mashing. Voila. It should look like below, except a little chunkier (I over-mashed with the potato masher). Oh. Always lick out the potato masher, or you’re an avocado waster. 10) Throw in the pits that you saved. This keeps the guac from browning, even overnight, in case you don’t finish the whole batch in one sitting.